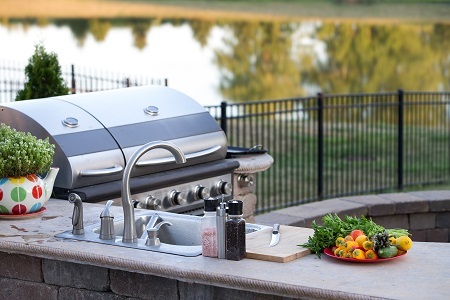 During the warmth of spring and summer, your outdoor kitchen might just be the pride of your backyard. But now that it’s cold outside spending the same amount of time in your yard isn’t going to be as delightful. During the warmth of spring and summer, your outdoor kitchen might just be the pride of your backyard. But now that it’s cold outside spending the same amount of time in your yard isn’t going to be as delightful. But before you can retreat inside to your indoor kitchen, you should remember to winterize your outdoor kitchen. By winterizing it, you can protect all of your equipment and surfaces until the spring thaw returns in a few months. Turn off the water supply. If the water supply shutoff valve is kept indoors, that’s even better. If it is inside, it will be protected against freezing. Inspect the water lines and make sure they are fully drained. Any water left behind in these lines can cause headache-inducing problems such as pipes freezing over and cracking. If you have anything electrical, be sure to turn them off and temporarily remove their power source. Although you might think it makes sense to do so, don’t throw that tarp over your outdoor refrigerator. Covering up your outdoor refrigerator or ice maker can be problematic because of moisture. You won’t see it, but the moisture will linger and find its way into the hidden electrical components. Be sure to take any remaining ice out of your ice maker and wipe them clean of any moisture that you can see. Shut off the water supply for outdoor sinks. You should also remove the lines that provide both hot and cold water. As we mentioned above, double check to make sure all water supply lines are properly drained. If possible, detach the faucets and bring them inside. Don’t forget to put a cover over the sink. Do you have stone countertops? If so, use some sealant on them. Using sealant will prevent unsightly stains from falling sticks and leaves as well as physical damage left behind by freezing temperatures. Protect Your Outdoor Kitchen This Winter!